Have you been thinking about switching your dog to a fresh dog food delivery program? Commercial kibble and canned food aren’t as healthy for your pup as you might think, and there has already been 6 dog food recalls in the first 3 months of 2019. Or, you might be cooking for your dog, but it’s time-consuming, and you aren’t sure if your dog is getting the right nutrients, so you think that fresh dog food might be a better option. Either way, deciding which fresh dog food delivery company is best can be tricky since there are so many to choose from. That’s why I’ve put in hours of research poring through the websites of the top competitors and comparing features, pricing, and reviews to bring you the 5 best fresh dog food delivery companies available right now. There is no one-size-fits-all answer, so we’ve included as many details as possible to help you decide which fresh dog food delivery company is the best for you and your dog. What are the Benefits of Fresh Pet Food Delivery? If you aren’t familiar with the idea of fresh dog food delivery, you might be wondering about its benefits and why you would choose it over other types of foods for your dog. Here are some of the benefits of fresh dog food delivery. It’s hard to beat the convenience of having your dog’s food delivered right to your door on a predictable schedule, especially when you have one or more large dogs and go through dog food at an absurdly quick rate. No more dashing to the pet store and hauling home giant bags of kibble. Most commercial dog foods are the equivalent of junk food for humans – it’ll keep you alive, but it probably won’t keep you as healthy as possible. If you feed your family with as many fresh ingredients as possible and try to avoid processed food, it will make sense to you that fresh dog food is just healthier than highly-processed kibble. Fresh dog food delivery is also healthier than a home-cooked diet because it’s been formulated (usually with the help of one or more veterinarians) to meet all of your dog’s nutritional needs. It can be tricky to give your dog exactly the right proportion of protein, veggies, carbohydrates, and vitamins and minerals, so fresh dog food delivery takes out all the guesswork. Most dogs LOVE the taste of fresh dog food. Even the pickiest of dogs will usually scarf down fresh dog food. A fresh dog food topper can also help encourage a picky dog to eat more of their kibble. For a senior dog or other picky dogs who have a hard time maintaining a healthy weight, fresh dog food delivery can be just what the vet ordered. Whether it’s the risk of contamination from raw dog food or the worry about recalls from other commercial pet foods, fresh dog food delivery is probably the safest way to feed your pet. 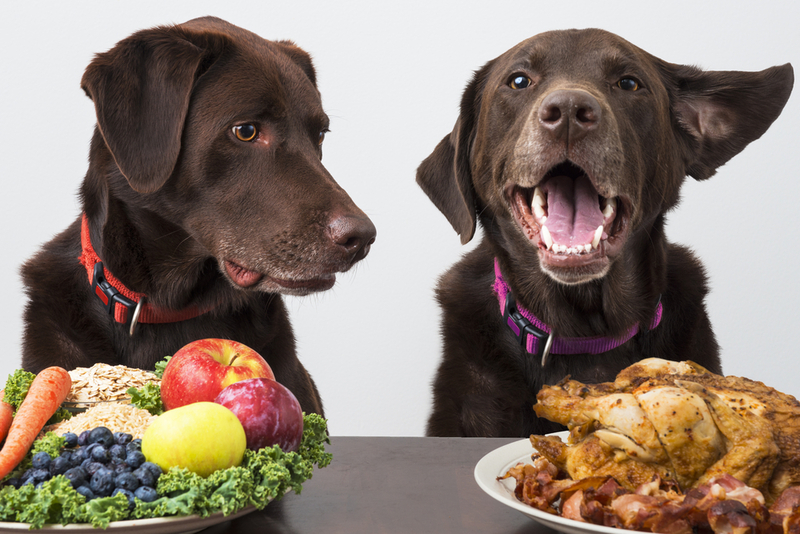 Since the food is thoroughly cooked, you don’t need to worry about your dog or your family falling sick from bacteria that can be found in raw dog food, and since the food is less processed, the quality control measures make fresh dog food healthier than the average commercial dog food. So how can you decide which fresh dog food delivery company is best for you and your dog? There are several different factors to consider. Some fresh dog food delivery companies send your dog’s food in pre-measured packaging (like NomNomNow and Pet Plate), which is the simplest, most convenient way to feed your dog. Other companies force you to measure out a certain amount each meal and use your own container to store the leftovers between meals. Convenience also includes how frequently you can have orders delivered and how easy it is to pause or change shipment dates (like if you go on vacation). Have a picky dog or one with food allergies? Some fresh dog food companies only have 3 food varieties to choose from, with as few as one variety that’s grain-free. Others have 4 or more dog food varieties to choose from, all of which are grain-free (like Pet Plate). For dogs who don’t have any food allergies and aren’t very picky, variety may not be as important to you. There are no two ways about it – feeding large dogs is expensive, and fresh dog food delivery is more expensive than many other types of dog food. Depending on the recipe, some fresh dog food companies may charge more or less than others, and that price difference can add up when you have one or more large dogs you’re trying to feed. 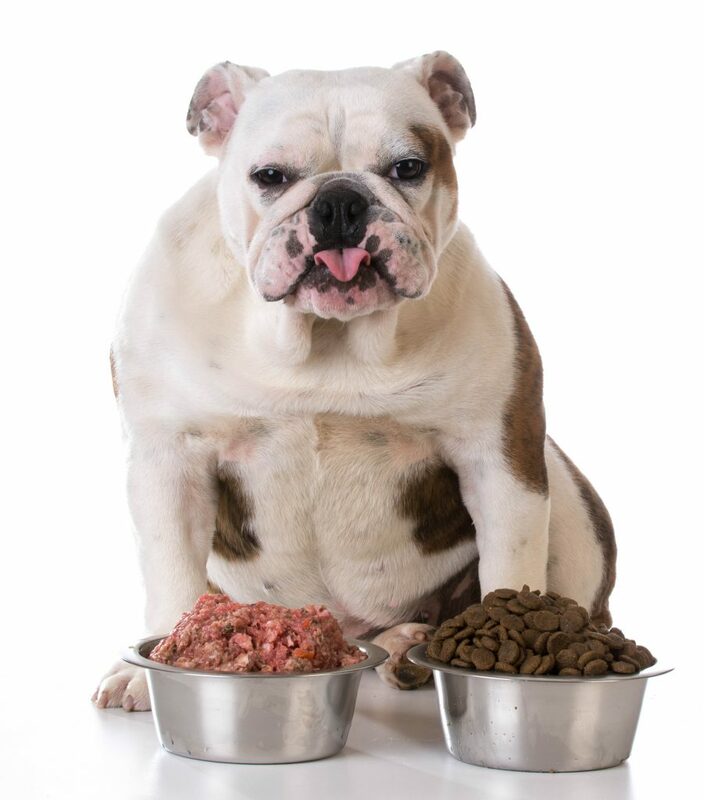 Some fresh dog food companies figure out portions merely based on your dog’s current weight, while others take into account their energy level, goal weight, and more to get a more precise portion for your pup. Would you rather cook for your dog yourself? Many people enjoy making their dog’s food, so they know exactly what’s going into it. 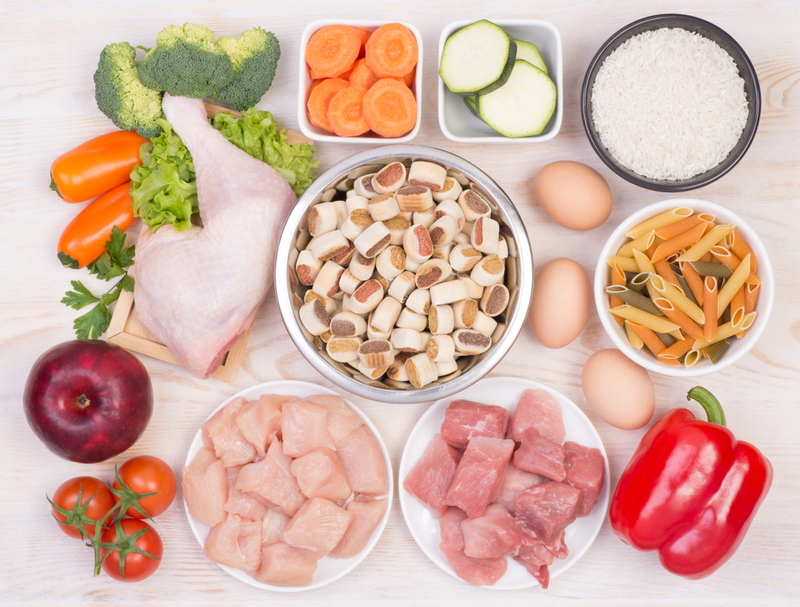 The only tricky thing about cooking for your dog is making sure you’re giving them the right proportions of nutrients along with enough vitamins and minerals. You may unintentionally cause your dog to suffer from malnutrition if you don’t get the ingredients in the right proportions. If you’re interested in learning how to cook for your dog, check out our article on the 10 Best Homemade Dog Food Recipes For Large Breed Dogs. With fresh dog food delivery, you can rest easy knowing that your dog is getting fresh ingredients in healthy proportions. It seems like there’s a new fresh pet food company every day. How can you decide which is best for you and your pup? I’ve done a ton of research on the most popular companies out there today and picked the top 5 based on convenience, customization level, price, and customer reviews (when I could find any). When getting quotes for prices, I inputted a 4-year-old neutered male Alaskan Malamute of average weight with an average activity level weighing 50, 70, or 90 pounds with no food allergies for every site (or as many of those as each site’s customization system required). These prices may vary depending on your dog’s customization and the food flavor. We are also not responsible for rising food costs after this article is published. For factoring in the convenience level, I factored in both how easy it was to feed and to store. NomNomNow tops our list for a variety of reasons. Not only is it one of the most affordable fresh dog food delivery services for large dogs, but since each meal comes in its own sealed bag, it’s the easiest to feed. You can get deliveries as often as once a week and as infrequently as once a month, with every other week being the most common option. It was formulated by a leader in veterinary nutrition, Dr. Justin Shmalberg, and offers both dog and cat recipes, which is perfect for households with both types of pets. There are 4 different dog recipes, and they’re all the same price, which makes it easy and predictable to rotate your dog’s food choices without changing the price each time. Most reviewers rave about NomNomNow, saying even the pickiest of dogs love the taste. People have commented on improvements in their dog’s weight, coat, and energy. There have been some recent reports of inconsistency with the size of the meat chunks and problems with a new type of packaging. It’s hard to beat NomNomNow. Unless you have a dog who needs a highly specialized diet, NomNomNow would probably be the first place to start when checking out fresh dog food delivery companies. With pre-proportioned containers, Pet Plate comes in a close second to NomNomNow. 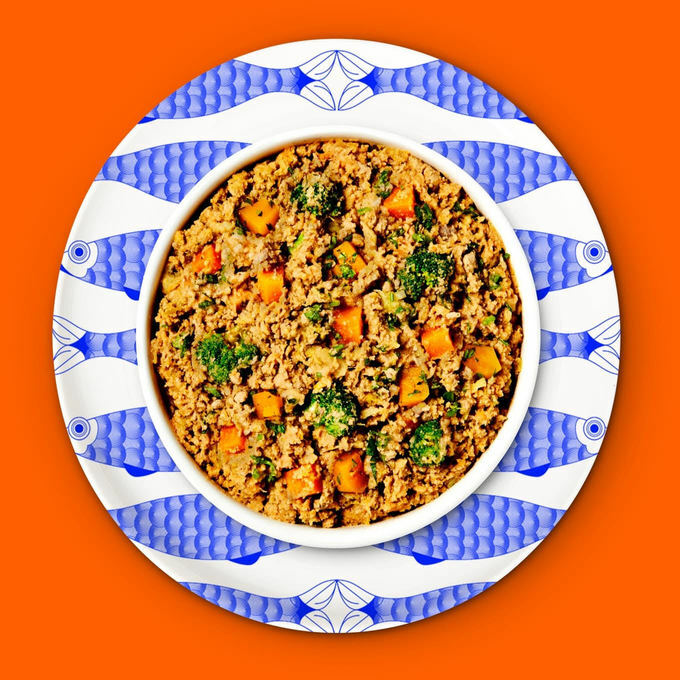 The biggest downside to Pet Plate is that the containers are large, unwieldy, and use a lot of plastic, so it’s not exactly great for the environment (or stacking in your fridge or freezer). One plus side is that the plastic containers are easy to heat in the microwave for pups who don’t like food cold from the fridge. You can choose between full and partial feeding plans. Most people rave about how Pet Plate improved their dog’s poop, skin, and coat. Most of the negative reviews were about the vast amount of wasteful packaging as well as late or incorrect deliveries (which were usually fixed by the company). 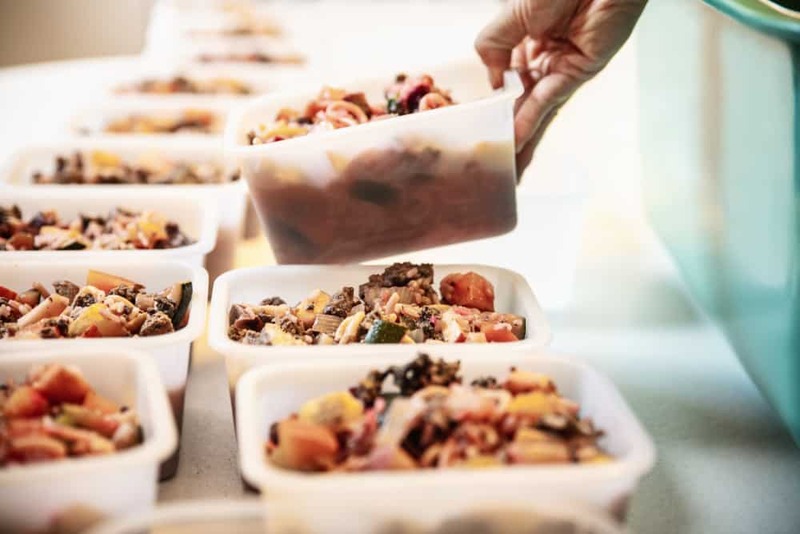 If you don’t mind washing and reusing the plastic containers for your own personal storage use, Pet Plate is another great option among fresh dog food delivery companies. If a constant supply of plastic containers feels like a crime against the environment, though, you’re better off going with another company on our list. Unlike the above two fresh dog food delivery companies, Ollie doesn’t come in pre-portioned servings. However, they do include a portion scoop, making it better than some other companies on our list. Ollie’s best selling point is that they are one of the most customizable fresh dog food delivery brands. They tailor your dog’s meal plan based on their age, breed, activity level, allergies, and ideal weight to figure out exactly how many calories per day your dog needs, while some companies go based on your dog’s weight alone. Pricing varies greatly depending on the recipe. Prices shown are for lamb recipe. Sadly, I could not find any user reviews, but Ollie was highly rated by several other review websites. Ollie has the most variation in their pricing based on the flavor, which takes them down a notch or two compared to other services, but they’re otherwise a great choice in the fresh dog food delivery space, especially since they’re more customizable than many other companies, and they also donate a portion of their sales. While most other fresh dog food companies cook their food in big batches, Grocery Pup is unique because they use sous-vide cooking, which is where the ingredients are vacuum-sealed in a plastic bag and cooked in water at a relatively low temperature (160 degrees F) for more than an hour. This is a high enough temperature to kill pathogens, but low enough not to destroy all the nutrients in the food. All the juices from the meat and other ingredients are locked in the bag, rather than lost during the cooking process, making Grocery Pup possibly the tastiest food on our list. The bag that the food cooks in is placed in another bag before being shipped to you, which means there is less chance for contamination because the food never leaves the bag it’s cooked in and isn’t exposed to the air or other contaminants. All of Grocery Pup’s foods come in 1-pound frozen bricks, with either 3 or 5 bricks per package. It’s up to you to thaw out a brick and measure out how much your pup needs, then package and store the leftovers. Fortunately, you can thaw out a brick for 30 minutes in water, just in case you forget to thaw it out the night before you need to serve it. 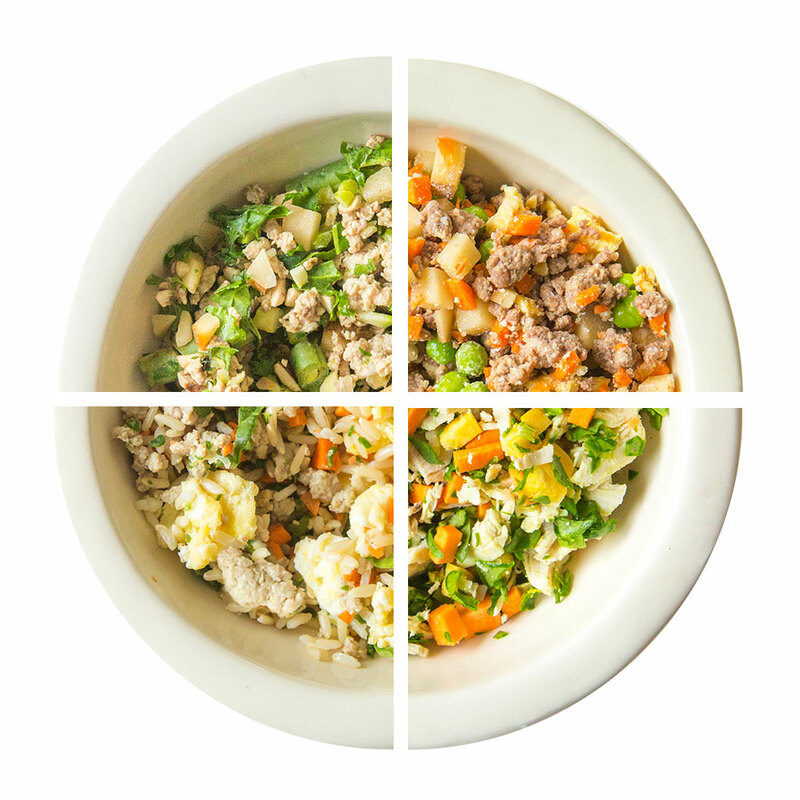 You can choose between full and partial meal plans. There is also an a la carte option to try the food before signing up for a monthly subscription service. Bitchin’ Beef Stew: Ground Beef, Beef Liver, Green Peas, Tomato, Russet Potatoes. Carrots, Non-GMO Canola Oil, MonocaIcium Phosphate. Calcium Carbonate, Sodium Bicarbonate, Potassium Chloride, Magnesium Oxide, Salt, Ferrous Sulfate, L-Tryptophan, Zinc Oxide, Selenium, Copper Sulfate. Manganese Sulfate, Calcium Iodate, Vitamin D3 Supplement. 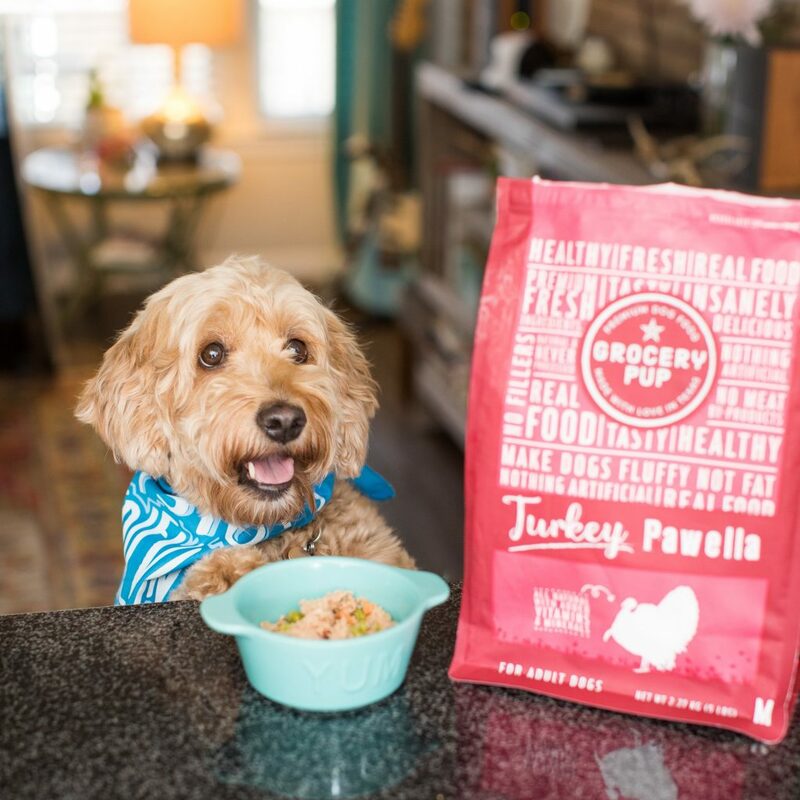 Most users raved about how much their dog loved the flavor of Grocery Pup, with comments about how it also improved their dog’s energy or stomach issues. The few complaints were primarily about the packaging. We love that Grocery Pup uses sous-vide cooking, even though they don’t offer single-serving packaging. The opportunity to try each flavor a la carte without needing to sign up for a subscription service first is a great offering that the other companies don’t have. Dogs love the flavor and seem to do well on it. 30% Off your Pup’s 1st Meal Delivery with code FRESH30 when you subscribe at Grocery Pup! 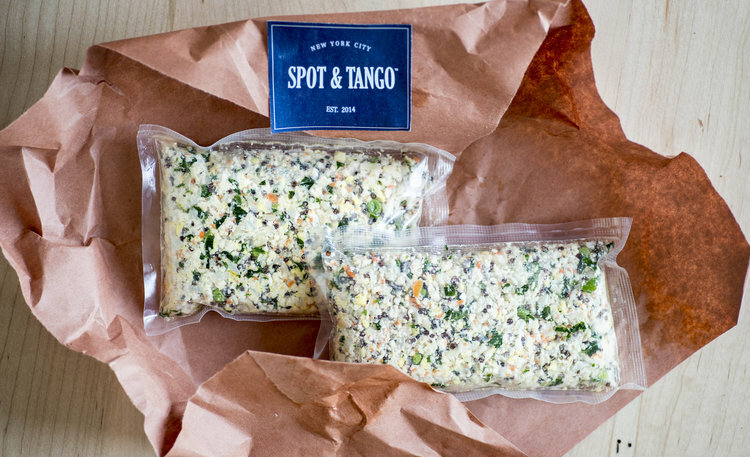 Unlike some of their competitors, Spot & Tango uses locally-sourced ingredients “from local farmers and suppliers who share our values.” The meals are made fresh in New York just days before being shipped, so the food is as fresh as possible when it arrives at your door. Spot & Tango is one of the only companies that includes eco-conscious packaging, which is a plus. On the downside, they only have 3 recipes to choose from. Pricing varies depending on the recipe. Prices listed are for beef millet recipe. Unfortunately, I couldn’t find any user reviews, but Spot & Tango ranked well on other review sites. If you’re especially concerned about the environment, Spot & Tango may be the best way to go. 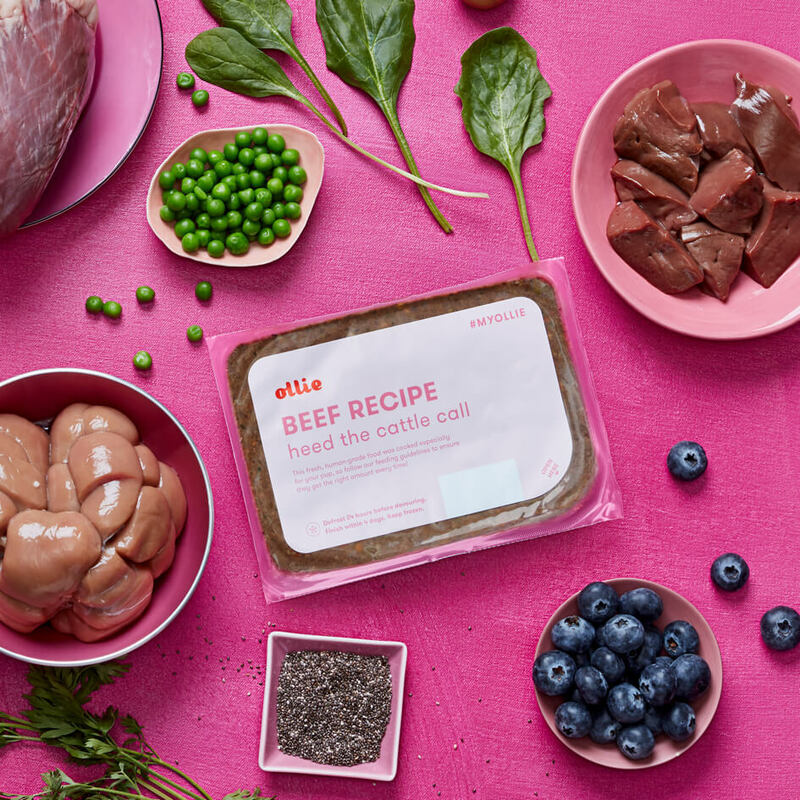 With their eco-friendly packaging and close relationships with their supplying farms, they seem to be the company most concerned with the future of the planet in addition to your dog’s health and wellness. You may already know that abruptly switching your dog from one food to another can upset their stomach. This may be especially true when you’re switching your dog from kibble to fresh dog food delivery. It’s best to start by mixing a little bit of the new food in with a lot of your dog’s old food. Each day, gradually increase the amount of new food and decrease the amount of old food you give your dog. 4 out of the 5 companies on this list offer partial-plan options, which can be a great way to slowly transition your dog from kibble to fresh dog food. Hopefully, we’ve helped you pick out one or two top contenders for the best fresh dog food delivery companies that will work the best for you and your pup. Fresh dog food is a great way to feed your dog a healthy diet without taking the time to cook up massive batches of food at home, and fresh dog food delivery is arguably the most convenient way to feed your dog.